Raw. | love lives on. What I know for sure about raw diets for dogs can be summed up in two words: Not much. I feel like the more I read, the less I know! I guess that is always the case when you leap into something new (learning a language, a new job — one day it just clicks). I do know there is controversy (between traditional vet medicine and more holistic approaches). But sometimes, with the dogs, I have to go with gut instincts. Thus, we are trying Melvin on raw. My motivation is simple, I love him. I want to always be able to say, we did everything we could for each of his issues. His liver values seem to want to stay high (bad) and I so desperately want to show those values who the boss is. To do that, we need to at least try to get him off some of his medications. Raw diets have shown great promise for dogs with colitis and allergies (Melvin has both) by getting many dogs off medications so after much deliberation (and much conversation with those who know much, much more than my amount of very little) we are wading into the shallow end (a comical metaphor to use since Melvin can’t swim…). The first thing we did was add a little teeny tiny bit of a freeze-dried raw food to his normal meal just to see how he handled the introduction of a protein to his diet (his current prescription food is a pre-digested protein). We tried beef via Stella & Chewys. For one week I watched his every move, counted itches, looked way to closely at his poop. And the verdict, he seemed fine. Yay! So this week we are trying fresh raw (bought at the dog supply store, the type already mixed with veggies and fruit – I still don’t get the ratio of meat to bone to all the other things enough to make it at home). If only Melvin could make his own meals. I feel extreme nausea at the site of the blood that looms at the bottom of the container and have to force myself to hold back gag reflexes as I mix it into his bowl. (“You love him, you can do this”). You know who hasn’t gagged? Melvin. He loves it. I don’t know that we will make a transition to all raw just yet but so far so good, although it’s only day three of this phase. Never a dull moment! Here is Melvin in his new Sirius Republic collar (cannot tell you how much we LOVE it)! Leather collar, raw diet, Melvin is proudly NOT vegan (although with each meal I prepare for him, I am one step closer to it). You have a stronger stomach than me! I think if we had to switch Lily to a raw diet I might have to make my husband prepare all her meals. Luckily she seems to be just fine eating her grain-free dry food. Also I love that Melvin is a lab who doesn’t swim. Lily is a beagle who (almost) never howls. This made me snort-laugh out loud! We should start a club for dogs who don’t act their breed! I had to jump into a pool to save Melvin from drowning, which is how I found out he was not buoyant! Love it! Lily also hides her treats around the house and then forgets where she hid them. So much for the beagle nose (though this doesn’t stop her from insisting on sniffing every. single. blade. of. grass. we pass on a walk). This will sound completely random but whee just love Melvin’s collar! Have a great day. I hear you! One of the motivators is that if raw works for Melvin, it will cost substantially less than his medications each month (one medication alone is $100 for 15 pills!). 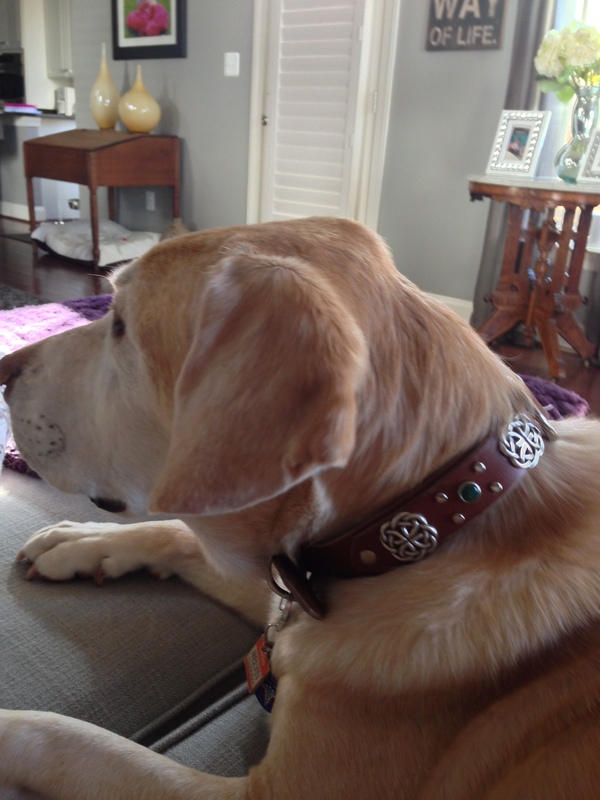 We love the leather collar and actually won it through a drawing so it was a cost savings also! Love the collar! Good luck with the raw diet, I hope it works out for him so dealing with the blood is not in vain. (I feel your pain, I can’t even watch medical shows on TV because I hate blood). You’re such a good doggie mamma! Thank you!!! I may get a surgical mask just for effect! We noticed a huge positive change in our dogs’ health when we improved their diet. We buy raw food nuggets which we can pour in. And we do a lot of other crazy things (pro-biotics, goats milk, etc). It costs more, and it takes more time, but it’s definitely worth it for the lower vet bills and health. Love hearing positive feedback on raw! We have ventured into pro-biotics also and are always open to other ‘crazy things’! You are a rockstar dog mom! I’ve got such a weak stomach I don’t know that I could do it, I have enough problems feeding Boomer and Dottie food from a can without gagging. I wish you the best of luck with the new diet and hope that Melvin’s values level out soon. And, by the way that’s one awesome collar. Thank you!!! I really do have to remind myself of the love but if it works, it will be SOOOOO worth the gagging! I get raw dog food from Wilson Meat Farm in Catlett.. great food.. dogs thrive and relatively inexpensive.. about $1.30 a lb..
OhMyGosh, this is so good to know! I’m looking into this right now! Thanks Sylvia! You are such an awesome dog mom! We would do anything for our babies, won’t we? (and I am totally cracking up that Mevin can’t swim!) Is Jake on raw too or is he on the kibble train? Jake is still cho choo’ing the kibble train however I started sprinkling the tiniest bit of the freeze dried raw on his meals and he tries to chew the bowl clean. If if works for Melvin, I’ll try moving Jake over. Rufus gets one raw bison knuckle bone a week and that replaces one meal. I also feed him a mixture of Honest Kitchen (Zeal) and Acana kibble. Have you looked into Honest Kitchen? It’s dehydrated so it’s more sanitary and easier to deal with. Although they use veggies and other things mixed in as well so it might not be safe for your sensitive Melvin. Worth looking into tho! I love the idea of a raw diet and am excited to see if it helps you. Keep us posted and let us know how it goes! We can’t really do raw diet right now because Tess is in a Therapy Dog Program (and they don’t want dogs on raw diets), but I always thought this would be something we’d be interested in trying! As for your reluctance to make it at home- just remember that the ideal is balance over time, not on a daily level. You don’t balance your diet perfectly in each meal, you go for balance over time. Same idea with the dogs. If the final goal is 80% muscle meat, 10% bone, and 10% organs (half of which is liver), you pretty much just get an idea based on the amount you feed your dog. My dogs get roughly a pound of meat per day. They get a bone-in meal such as chicken quarters every few days. The best way to judge if they are getting enough bone is to look at their poops. Soft dark poops mean not enough. Rock hard crumbling white poops means too much bone. Formed but not white or crumbly is the goal. Add more bone when feeding organs or a new meat, as both can result in loose stools otherwise. You can add in organs a little each day, or in larger portions. I generally feed an organ meal once a week, and alternate weeks between liver and other organs. I have posted on my blog with some “recipes” and weekly meal plans for the dogs in the past, if you are interested in checking it out. Uh, is it weird for me to say that I love you!!!! This is so friggen helpful! I will def check your recipes out!! Thank you!!!!!! For a dog with allergies, raw is definitely a “once-you-try-it-you-won’t-go-back” sort of thing. Maggie is on an all raw-ish diet due to her allergies (some food but probably mostly environmental). I give her dehydrated, freeze dried & raw raw. I just tried Grandma Lucy’s Pureformance, which she seems to absolutely love, as well as Honest Kitchen. I find the freeze fried foods in patty form (Stella & Chewy’s) to be way too expensive to use other than occasionally. Unfortunately, she’s currently banned from chicken, turkey & lamb due to it being a “warming” food a la Chinese Medicine. Per our holistic vet, she will do best on cooling or neutral foods (duck, rabbit, beef, fish). The whole concept is pretty new to me but Maggie’s doing better than she has in years and she is not on a single drug. We give her Dry Derma Relief (chinese herbs for allergy relief & skin/coat health), Braggs apple cider vinegar and probiotics as supplements to help her allergies. I used to describe her as the dog who was never comfortable in her own skin but no more! There is a very good chance I’m going to stalk you on this subject! Do you mind sharing what meds she was on and how long it took to get her off (ballpark)? I will prob send you an email through your blog. Thank you!!! !